All the 4 Internal Assessment Entries are completed and now available on AU-COE portal for All UG / PG Higher Semester Students. So, the Students can Calculate your Internal Marks based on your Internal Assessment Marks available on AU-COE Portal. Here we inserted a simple basic calculator for identifying the approximate internal mark. This is not a final mark and it can by little differ from the final AU Internal Marks. If you love this calculator, don't forgot to share with all your friends. Note : This calculator is designed for understanding and planing This is a approximate calculation based on information available in Regulation 2008 / 2013. And the exact calculation may differ due to the final decision of COE of Anna Univeristy. Institutions are instructed to upload the fourth assessment period for B.E./B.Tech 8th semester for the assessment period from (18-03-2014 to 01-04-2014). Web portal will be opened for fourth assessment entry on 02-04-2014.Institutions are also instructed to complete the fourth assessment entry for B.E./B.Tech 8th semester on or before 04-04-2014. Students : Its final semester Final Assessment report update. Ask your faculties to double Check your data before enter in to the Portal. 4th Semester and 6th Semester 3rd Phase Attendance Entry and 2nd Internal Assessment Marks entries are Completed. Students can check your Marks in COE Portal. Final Year Final Semester Students 3rd Phase Attendance Entry and 2nd Internal Assessment Marks entries are Completed. Final Year Students can check your Marks in COE Portal. First Year Second Semester Students 2nd Phase Attendance Entry completed. First Year Students Can Check your Marks now at COE Portal. First Year Second Semester Students 2nd Phase Attendance Entry and First Internal Assessment Mark entry Period is over by today. First Year Second Semester Students, 2nd Phase Attendance Entry and First Internal Assessment Mark is progress. Many Colleges are completed the entry work. B'caz as per the schedule the Final Year's 3rd Report Entry Period is starts by today. So, all the colleges are trying to complete the First Year Entry Works by today. And the colleges may starts the final year report entry by Monday onward. The First Year Students can check their Internal Assessment Report from the following link from 6.00 PM Onwards. First Year Second Attendance and First Internal Assessment Test Mark Entry schedule is starts today.But the Attendance Reporting Period is ending by tomorrow only. So almost all colleges are postponed the report entry work to tomorrow. So students, there is no need to check the COE Portal today. UG and PG First Year Second Attendance and First Internal Assessment Test Mark Entry schedule is starts by tomorrow. But the Attendance reporting period is ending with 13.03.2014. So most of the colleges will enter the reports only from 13.03.2014. And the Higher semester Report Entry Period will starts with 15.03.2014. But as per the revised exam time table the final year practical exams will be end of this month and the theory exams will be starts from 07.04.2014. So the Final Internal Assessment test date and reporting period may be will changed. Students can Check their Attendance and Internal Assessment Test Marks in Anna University COE Portal. COE Portal is now with a new Pro Look. Feel the change now. Almost all colleges are completed the portal entry work. So, You can check your Report now. Students can Check your Attendance Report and Internal Assessment Marks now at COE Web portal. And contact your faculties immediately if there is any mistakes in the report. Few colleges are completed the portal entry work.You can check your Report now if your college completed the work.Students can Check your Attendance Report and Internal Assessment Marks now at COE Web portal. All Higher Semester Internal Assessment Test Marks and Attendance Report Entry is going well. Students can Check your Attendance Report and Internal Assessment Marks now at COE Web portal. / M.E./M.Tech./M.Arch. (Part-Time) IV Semester Students, Second Attendance Report Period is coming to end by tomorrow. So, Colleges will start the COE Portal Entry for Second Attendance Report and First Internal Assessment Exam Marks by tomorrow on words. The Entry Period is coming to end on 04.03.2014 but, most of the faculties will complete their work within one or two days. SO students can check their report status from tomorrow 28.02.2014 evening 6.00 PM onwards at the COE Portal. Mostly all colleges are completed the First Year Second Semester Students' the First Internal Assessment Attendance Report Entry on AU-COE Portal. Students can check their attendance status now (6.00 PM to 7.00 AM)visiting the COE Portal. For First Year Second Semester Students, the First Internal Assessment Attendance Report Entry Period is started on 14.02.2014. This reporting entry period is 14.02.2014 – 21.02.2014(Only Attendance). This is the only long period which is given by AU. Normally they give only 3 to 5 days for Entry. Now only they give 8 days. Except very few colleges, all other colleges are completed the entry work. Students can check their report from evening 6.00 PM to morning 7.00am on coe1.annauniv.edu web portal. Check the portal immediately and if found there is any variation in your attendance immediately contact your class teacher or exam cell to avoid the reduce of Internal Mark on your university examination. First Internal Assessment Report period is completed by 03.02.2014 for higher semesters. AU COE strictly followed the Attendance and Internal Assessments Marks to prepared the Internal Marks. So,Students please check your attendance report on Coe1.annauniv.edu portal.And contact your faculty if there is any correction in your attendance report. 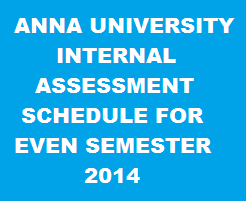 Anna University Internal Assessment - I Attendance Report almost completed by many colleges. Check your status, and contact your college if there is any discrepancy. Don't forgot to change the corrections by your faculty. Most of the colleges almost completed the First Attendance Report Entry in AU-COE Portal. AU-COE Portal Entry for Higher Semester - First Attendance Report Entry has been started.Most of the colleges started the entry work. You can check your attendance status on portal. Anna University Currently following a Internal Assessment System for all of its affiliated colleges' students. Based on this Assessment Report only AU-COE awarded the Internal Marks on Last Semester (Dec-2013). For this semester Internal Assessment Schedule is already published. You can Check the Internal Assessment Schedule here. As per the above schedule, the All UG 2nd Year and 3rd Year Full time and Part time students' First Report will be updated into the AU-COE Portal from tomorrow (28.01.2014) to 03.02.2014. Based on the Internal Assessment System, the colleges are not able to give a lot of marks in internal as per their wish.So, its very difficult to students for scoring more marks on university exams. So, All the students are requested to keep maintain their attendance and Internal Marks in a good position to pass in Anna University Exams.